All welcome on Sunday 25th June, 3-5pm to an opening event for the new wildlife pond and meadow near Gid Lane, Froyle. If arriving by car (see map ), please park at Froyle Park which is about 400m from the pond. Enjoy some refreshments courtesy of Froyle Park after 3pm and view information displays about the importance of fresh water habitats. Then walk down the Lime Avenue to the pond for the ‘ribbon cutting’ event at 4pm. See the wildflower meadow that surrounds ‘Froyle Park Pond’ and linger to observe what’s flying and flowering. Dragonflies have already found the new habitat and the wildflower seed sown last year is blooming. The pond area will then be open at all times to members of Froyle Wildlife and can also be seen from the adjacent public footpath. This project was funded by developer contributions through East Hampshire District Council and completed with the kind permission of Froyle Park Ltd. Conditions of our access licence include visitors using only the stile for entry/exit (see plan) and no fires, BBQs or picnics. 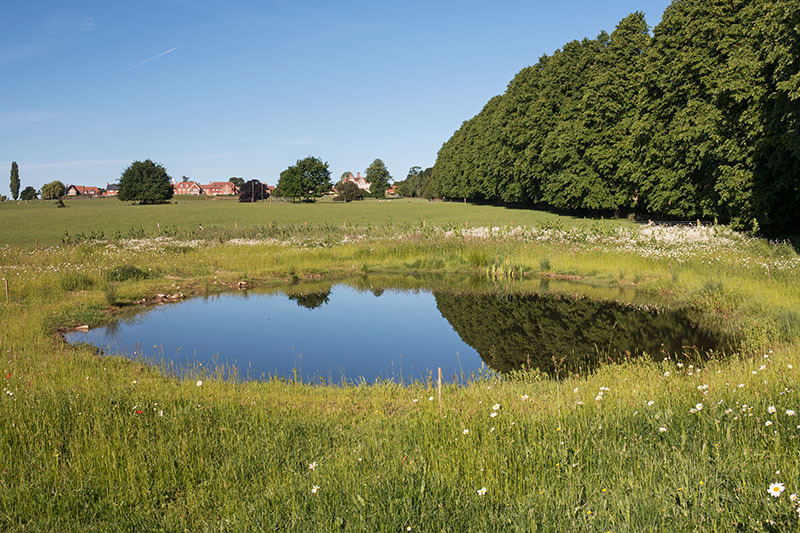 Advice from wildlife pond experts is to let the pond colonise naturally over time. So please do not introduce any fish, aquatic species or pond plants because this could bring in diseases or potentially invasive non-native species.